Sabbath Walk: To Welcome or Not to Welcome? To Welcome or Not to Welcome? TITLE: TO WELCOME OR NOT TO WELCOME? The Paris attacks last week easily consume the front pages of most major dailies around the world. With sensational reporting and graphic pictures, followed by commentaries and opinion pieces, everyone have heard at least something about it: Terrorism in France. Hundreds of people died, mostly French. By targeting at key popular spots such as soccer stadiums, restaurants, cafes, concert halls, etc, the objective of the co-ordinated attacks is to instill fear and a sense of insecurity among the people. It has partial success. As Parisians grapple with a world that would never be the same again, they realize that safety and security cannot be taken for granted. Flowing tears of grief are mixed with growing fears of new threats that could come anytime, anywhere, and to anyone. These fears resulted in more counter-terrorist actions. The next day, France launched one of the largest assaults at terrorist targets in war-torn Syria. Today, anti-terrorist forces continued their hunt for the masterminds of last Friday's attacks. As world leaders and community groups come together to pray for France, social media is filled with notes of love with #PrayForParis. At the France-England friendly soccer match yesterday, although England won 2-0, the result did not matter. The highlight was not the soccer game but the events before the game. United as one people, both French and English national anthems were sung by all in the stadium, including a sizeable number of French in the crowds. It is a show of unity and defiance against terror, saying that good will always triumph over evil. Everywhere we go, we see the French flag colours of red, white, and blue across monuments, buildings, and public events. The social media titan, Facebook has even made it easier for users to create French coloured backgrounds for them to express their sharing of grief and their solidarity with the French people. As emotions run high with world support for the French victims and families, there are other voices that seem to look at the world sympathies with sarcasm. Why must world media attention be focused on France over a day's incident and ignore countries where bombings happen on a daily basis? One such reaction can be found in a widely shared retort by someone who shared about the bombings in Beirut last Thursday where 40 over people died. Karuna's post has gone viral, shared by many people on social media. I wonder why? Is it because people have been jolted about the reality of the world beyond beautiful France? Is it because they are guilt-tripped into recognizing the hypocrisy of self? Is it because they have failed to pay attention to the reality of bombings and terrorist attacks in countries often out of sight and out of mind? I guess, it would be fair to say it is all of the above, in varying combinations. B) What About Syrian Refugees? There are other lingering problem with regard to Syria. The refugee crisis that is fast approaching record levels never seen before in recent history. Across many countries in the West, it has become a political controversy and is testing the social fabric of every nation. Some countries have shut their doors right from the start, claiming that they have no capacity. Other countries like Germany have expanded their own refugee quotas and as a result, put their own political future on the line. In Canada, newly elected Prime Minister Justin Trudeau has pledged to bring in 25000 Syrian refugees by the end of this year. 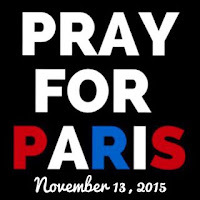 It is an ambitious target made more complicated by the recent Paris attacks. The fears are genuine. What if terrorists are hiding among the refugees? What if another bombs go up in another major Western city? What if the security screenings are so hastily done that radicals are allowed into the country? Several states in America have already started to shut their borders from any refugee programs. Countries like Poland have rejected their initial refugee quota. Within Germany, there are growing anger against the German leader for accepting so many refugees. In Canada, there is a backlash against Muslims for what happened in France. What about Christians? Should Christian leaders take the lead in answering the questions: "To welcome or not to welcome?" How should Christians in the West respond to the refugee crisis? Commentators like Mark Galli of ChristianityToday see the refugee crisis as an opportunity for "a beautiful gospel witness." Galli laments that America "has become increasingly stingy about welcoming the tired, the poor, the huddled masses yearning to breathe free." Quoting statistics about how Germany, a size with a population of only a quarter of America's can admit 800,000 refugees, America is particularly miserly with debates on a mere 70,000 to 100,000 refugees. Of course, there are economic concerns that the refugees will tax the already embattled social welfare structures in the country. More than that is the fear of terrorism in our midst, whether there will be Trojan horses. Courage must speak louder than cowardice. Compassion must overwhelm fears. Love must reach out with hope and peace. In a related article, also in the Washington Post, Michelle Boorstein ponders on the question: "Would Jesus Take in Syrian Refugees?" After bringing out some calls for and against by various politicians and Christian leaders, the question becomes a matter of how to distinguish between peace-loving refugee and a bomb-wielding threat in the making. Uncannily, Boorstein does not answer the question of Jesus directly. The obvious answer is YES. The hidden emotions mutter NO. The general agreement is MAYBE, until the tension between fear and compassion is resolved. "13This is how we know that we live in him and he in us: He has given us of his Spirit. 14And we have seen and testify that the Father has sent his Son to be the Savior of the world. 15If anyone acknowledges that Jesus is the Son of God, God lives in them and they in God. 16And so we know and rely on the love God has for us. God is love. Whoever lives in love lives in God, and God in them. 17This is how love is made complete among us so that we will have confidence on the day of judgment: In this world we are like Jesus. 18There is no fear in love. But perfect love drives out fear, because fear has to do with punishment. The one who fears is not made perfect in love." Of course, it is easy to say: "But that's Jesus in the 1st century. This is 2015 and Jesus didn't have to face ISIS then!" While it is true that Jesus didn't have Osama bin Laden, the Taliban, or the radical Muslims of today, he did encounter vicious forces of evil against him. The devil tempted him time and again. The Pharisees plotted against him. Many uttered death threats. His disciples forsook him. Pilate left him to die, choosing to free a known criminal instead. It is presumptuous for any contemporary person to belittle what Jesus himself had to go through. At the same time, it is fair to say that the world we live in is more complex than before. We are continuing to learn how to be innocent as doves but wise as serpents, which in itself is Jesus' teaching. I think the Church must support government efforts to resettle the refugees, either in their homeland and if necessary, open our doors to them. There will always be risks involved. The tensions are real. On the one hand, we want to be welcoming. On the other hand, we don't want another disaster to happen just because we want to be nice. The truth is, there is no guarantee. I wrote the following a couple of days ago, lamenting this tension. In all things, let love guide the tension's ups and downs. It's nice to welcome refugees but not wolves in sheep's clothing. It's nice to rush help but not so nice to compromise safety. It's nice to assume people would assimilate, not divide. It's nice to think of refugees becoming more grateful. It's nice to presume that refugees will automatically learn English, German, French, and not stick to their own native languages. It's really nice to expect reciprocal behaviour. It's nice to believe that if we do good, people would appreciate. ...... Until a bomb explodes downtown, taking out cafes, concert halls, and convention centers. Until a suicide bomber maims kids and people in a market. Until the past sense of security gets replaced by a future sense of panic and insecurity. 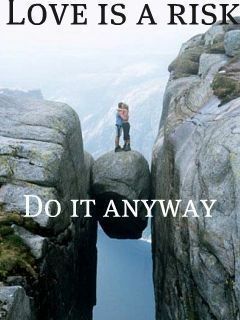 My point: Love is a risk. If you want to help, do so but be prepared for all the risks. Be ready for all the evils that could creep into any hastily assembled rescue plan. Be ready to ask: "What if tomorrow never comes?" Be even more ready to shout out: "I know who holds tomorrow!" In this life, there is no guarantee that things will work out the way we have planned. Some decisions will succeed while others end up as tragic failures. If we don't try, we will never know. The only assurance is God's Promise of a better tomorrow, when He finally arrives in all His Glory. If we really want to fear, fear God. Pray for Paris. 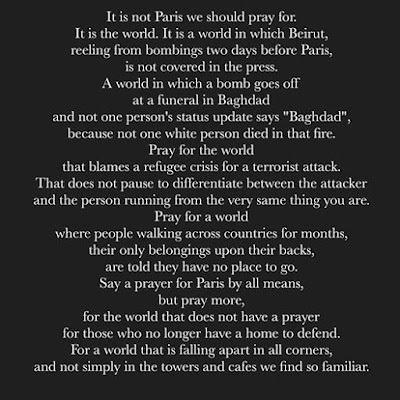 Pray for the world. One more thing. Pray also for ourselves.